The vast majority of self-catering rental properties throughout Spain were designed and purpose built purely to serve as holiday accommodation. Although strictly the same is true of El Capistrano, its original Canadian developers had the foresight to come up with something quite original. El Capistrano is actually a deliberately constructed replica of a traditional Andalucian "pueblo blanco", or "white village", characterised by houses with red-tiled roofs, whitewashed walls, balconies, terraces and wrought ironwork and so on, very similar to those of, say, Frigiliana or Mijas . However, rather than being located way up in the mountains, El Capistrano has all the advantages of being located within the lovely and traditionally Spanish seaside town of Nerja. Although the house designs were made as authentic as possible, they do also include those mod cons, such as fitted kitchens, washing machines, showers, etc, which the modern holidaymaker demands. 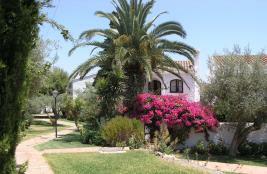 A visit to El Capistrano provides a unique and very special opportunity to experience living in a traditionally designed Spanish village house, in a traditional village environment, but with every modern convenience, close proximity to town and beach and so on. The development is situated on a hillside with views of the sea in one direction, and stunning views of the mountains in the other. We think that it is one of the loveliest spots that we have ever seen, and that a week here is an experience that you will never forget. As the accompanying photographs ably demonstrate, El Capistrano's setting is absolutely idyllic, with beautifully laid out narrow streets, scented with foliage and flowers, attractive little squares, fountains and immaculately maintained gardens. The village itself is particularly suited to holidaymakers with small children, being virtually car-free (the access road travels around the outside of the village, with ample car parking provided, but the interior streets are not open to vehicles). For peace of mind, the village has its own security staff and pool life guards. Although its origin might have been slightly synthetic, over the last 30 years or so El Capistrano has matured into a genuine village environment, with many full time residents of various nationalities, as well as short-stay holidaymakers. On site are swimming pools (including a safe children's pool), bars, a café and restaurant, and supermarket. Properties range from one or two bedroom apartments, two or three bedroom villas and townhouses to a few somewhat larger properties with private pools. However, every property remains within a single coherent 'village' environment. In reality there are actually five distinct 'Capistranos', within a short distance of each other, and it has to be said that some of the tour operators who arrange accommodation here are not always as careful as they might be in disclosing which one their clients may end up in. This was the first development constructed, as described above. In our view this is still the only 'true' Capistrano, with the authentic tranquil 'pueblo blanco' feel to it. And if you are a cat-lover then El Capistrano Village offers a real treat for you, as described in our accompanying website, www.CatLoversInCapistrano.com, named after the organisation (CLIC) that cares for all types of felines in this area. Just across the access road to El Capistrano Village lies Capistrano Pueblo, a very similar, intimate, development, with somewhat smaller properties, many of them duplex apartments, and with its own pool and other facilities. A half mile or so further out of town lies Oasis de Capistrano, a smaller, more modern and very popular development. Again built along essentially similar lines, its lush greenery and peaceful setting making this development's name particularly appropriate. Oasis is located in a valley facing the sea, and has its own direct path down to Burriana Beach. To one side a picturesque aqueduct borders a rural setting of traditional smallholdings growing local produce. Its communal pool is in a large lawned garden where sun beds and waiter service are available. There are also two restaurants within the development. A mile or so higher up the hillside is San Juan de Capistrano, which is similar again, although built to a rather more open scale. Stretching up as it does into the foothills of the Almijara Mountains, San Juan de Capistrano offers spectacular views over Nerja and towards the sea and an abundance of restaurants and bars.